Expert Arts is a new professional and business development initiative of the Ministry for the Arts in Victoria, Australia. One of the events to be held next week is the “Expert Arts – Cultural Entrepreneurship” on August 05, 2014 at 16:00 at the ANZ Pavilion, Arts Centre Melbourne. More events and info and FREE registration here. Check the video here showing the speaker’s presentation and voice over (duration 42:54). 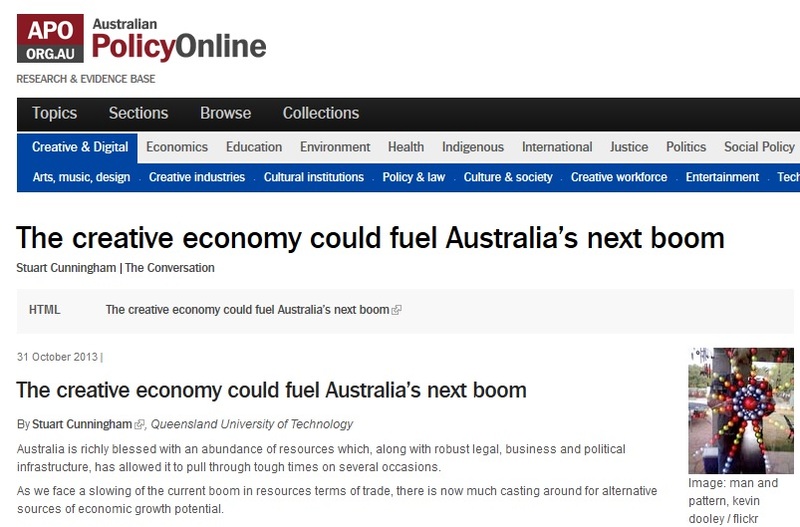 In this very interesting article, by Stuart Cunningham from the Queensland University of Technology, Australia, the author reveals the possibilities the Creative Economy can offer to boost Australian economy since the slowing of the economy in terms of trade. He points out to alternative sources of economic growth potential. Particularly, he talks about the Australian story, the role of the Government and how design thinking can promote business applications.